Gold futures shed 0.4% on Monday, Oct. Most precious metals futures declined Monday in their kick off to the new trading week, month and quarter. Gold for December delivery declined $4.50, or 0.4%, to settle at $1,191.70 an ounce on the Comex division of the New York Mercantile Exchange. "Keener risk appetite is in the marketplace to start the trading week has the precious metals under pressure, as does a firmer U.S. dollar index today," Jim Wyckoff, a senior analyst at Kitco Metals Inc., said in a report. "It’s very likely going to take a geopolitical shock to the marketplace to jumpstart a decent rally in the safe-haven gold market." 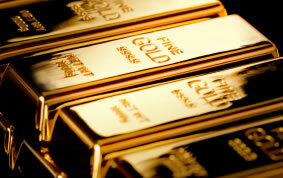 Gold futures ranged from a low of $1,188.10 to a high of $1,196.50. They closed the third quarter on Friday with a sharp 4.7% loss and finished 0.9% lower in September. Meanwhile, silver for December delivery lost 20.5 cents, or 1.4%, to settle at $14.507 an ounce. Silver futures traded between $14.39 and $14.73. In closing Friday, they gained 1.1% in September but sank 9.2% in the third quarter. January platinum rose $5.50, or 0.7%, to $827.90 an ounce, ranging from $811.40 to $828.40. Palladium for December delivery declined $16.40, or 1.5%, to $1,056.40 an ounce, trading between $1,037 and $1,066.40. an ounce. On Friday, it logged its best close since Jan. 29. Gold added $2.10, or 0.2%, to 1,189.35 an ounce. Silver rose 24.5 cents, or 1.7%, to $14.55 an ounce. United States Mint bullion products increased by a combined 2,500 ounces in American Eagle and Buffalo gold coins and by 350,000 ounces in American Silver Eagles. Fair warning to anyone thinking about opening an account at the US Mint. Once you open an account it cannot be deactivated or deleted, EVER!